In Washington, D.C., officials shortened a new teacher evaluation checklist after complaints from teachers and principals that it was too long and time consuming. As Los Angeles officials and union leaders wrangle over the design of new teacher evaluations due to roll out citywide this year, the experiences of other states and districts offer both inspiration and lessons about what not to do. More frequent and rigorous evaluations are part of a new national push to improve the quality of the teaching force. Two-thirds of states are in the process of adopting new evaluations, and many will include student achievement – usually as measured by standardized tests – along with intensive classroom observations. It’s unclear whether the new evaluations will have the desired effect. Even in places with a few years of experience using new systems, there is not enough data to tell for certain whether student achievement is improving as a result of the evaluations. Washington, D.C.’s experience may be particularly instructive to districts still in the process of designing evaluation systems. The city’s system has been overhauled twice in response to feedback – and problems. The number of standards on which teachers are measured during a classroom observation was reduced to 18 because teachers found a checklist of 22 indicators too long and confusing. (Los Angeles plans to adopt a checklist with 61 indicators, though evaluators are supposed to focus on 21 of them.) The number of categories for teachers – ranging from “ineffective” to “highly effective” – increased from four to five in an effort to prevent inflation in the ratings. And teachers who have consistently scored well will no longer be observed as frequently as lower performers to save time and lessen anxiety among teachers. Tennessee also reduced the observation workload because principals felt overwhelmed. One of the biggest shifts in D.C. was the decision last year to reduce the reliance on test scores in favor of other measures of student achievement that teachers will determine with their principals. Before, value-added measures, which calculate expected student growth on standardized tests, counted for 50 percent of a D.C. teacher’s rating. But value-added measures have been widely criticized as unreliable. Going forward, they will count for 35 percent of a teacher’s overall evaluation. Most systems combine two main factors in measuring a teacher’s performance: a rating based on at least one formal classroom observation and a rating meant to capture how much students learn during the year. Previously, most states called for evaluations that relied on a single observation, and tenured teachers were not observed every year. 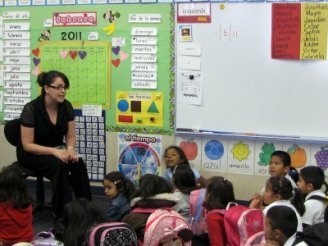 In Los Angeles, the teachers union and district officials have reached a tentative agreement to use classroom observations and a mix of data, including raw test scores and whole-school performance, to rate teachers instead of value-added measures. Other states have left it to districts or schools to create their own “student learning objectives,” such as portfolios of artwork or improvement in skills like playing scales on a trumpet. At the same time, a nearly universal piece of advice from education officials in other districts and states is to work closely with teachers when designing the new evaluations. Dozens of teachers in New Haven, Conn., have left because they were rated poorly under the new evaluation system. But the union was a partner in developing it, and criticism has been muted compared to elsewhere.